Length: 67 ft. 5 in. Wingspan: 43 ft. 7 in. Height: 13 ft. 11 in. Maximum Takeoff: approx. 54,000 lbs. The YF-23 was the newest technology demonstrator from the Northrop company. 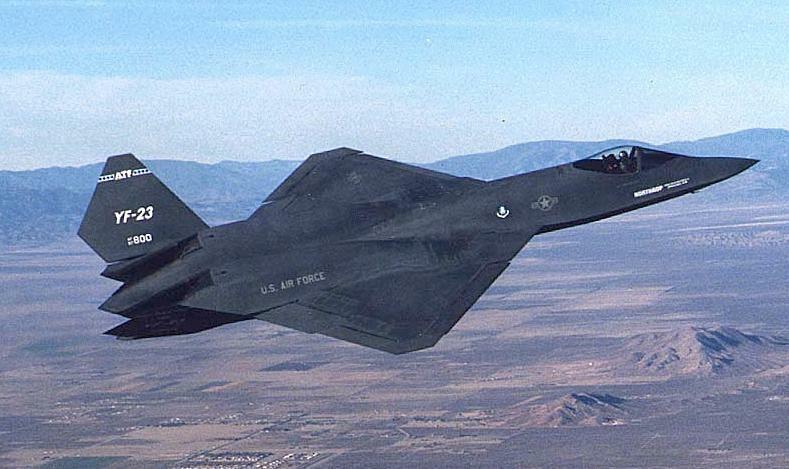 The YF-23 prototypes are 67.4 feet in length and have wingspans of 43.6 ft. During the Advanced Tactical Fighter program, one YF-23 was powered by twin Pratt and Whitney YF119 turbofan engines, while the other had two General Electric YF120 turbofan engines installed. The aircraft achieved a speed of around Mach 1.8 throughout the program.